This is the first of a two-part post. Saturday, July 23, 2011 9:14 a.m.
Got your letter yesterday. Well, actually, your letters. All eleven of them. I studied them in a way I hadn’t before: listing them by the date written, reading your diaries to learn about what was going on in your life then, and thinking about why you wrote them to me at all. 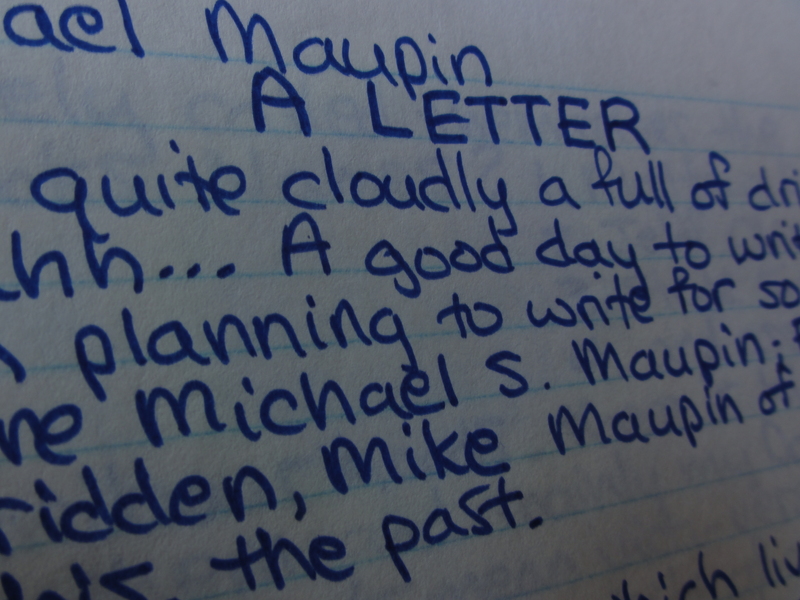 But of course you addressed them to the “future Michael S. Maupin,” so I knew they were meant for me, even though they were never sent. Except for the last letter. By the way, it’s finally 2011. Yep, this is the December we find space aliens in Santa’s bag. Thought you’d be all excited about that. Well, my young friend, I’m here to tell you that “deep thinking” also leads to woolgathering and navel-gazing…and, more often than not, a less-well-understood sense of self. But maybe that’s just 40 plus years talkin’. There were two letters in 1973, one intended as a second part to the first, and that was going to be that. Mike, I’m here to tell you that you were experiencing a clash of contrasting temperaments. Your father was more comfortable with black and white answers, even when the world presented him with only gray questions. You, young Jedi, genuinely loved the questions. The unknown excited you, and you embraced the insecurity of not knowing by always trying to find out. You were relentless. Maybe that’s what frustrated other people, especially your dad. You wrote three more letters to me that year: about your summer, becoming managing editor of the junior high school paper (Dude! You’re still a managing editor. How’s them apples? ), and describing your friends and their lives as junior high freshmen. Then came 1975, when you wrote Letter VII and Letter VIII, in mid-August and October, respectively. You recapped that summer, about how you started working as a busboy at the Lafayette Club and, in the fall, began school at the senior high. Then it occurred to me: Things weren’t real for you until you’d written them down. Do you realize that now? ~ by completelyinthedark on July 24, 2011. I hear virtual reality is a naturally occurring state. Drafting new posts in time for Friday due dates is another kettle of fish! Busy week but have forthcoming all-new post in the hopper. Here’s a golden oldie.